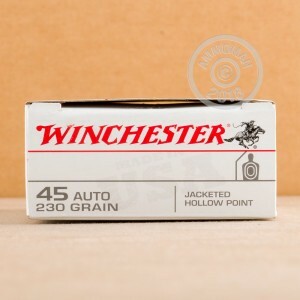 This .45 ACP hollow point ammunition from Winchester is a great value with many potential uses. Not quite as effective in a self-defense role as Winchester's premium Silvertip or Ranger offerings, these rounds deliver solid expansion and work well for testing weapon reliability with hollow points, short-range hunting and pest control, or simple target shooting. 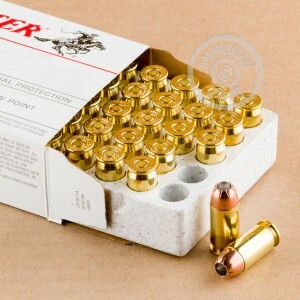 Each cartridge in this box of 50 fires a 230 grain jacketed hollow point bullet at a muzzle velocity of 880 feet per second, delivering typical .45 Auto ballistics. This is a standard pressure load that will work well in subcompact or older firearms. 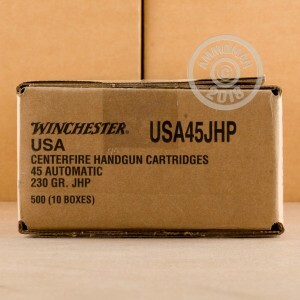 Winchester ammo is loaded in Oxford, Mississippi using non-corrosive Boxer primers and brass cases.